Nintendo has had its ups and downs with indie developers, but the Switch seems to be doing things right. The versatile console has become a lot of people's indie machine of choice, and most games released on the system seem to be performing well. While it's still early in the system's life, one thing we haven't seen a lot of yet is indie games programmed specifically for the Switch. 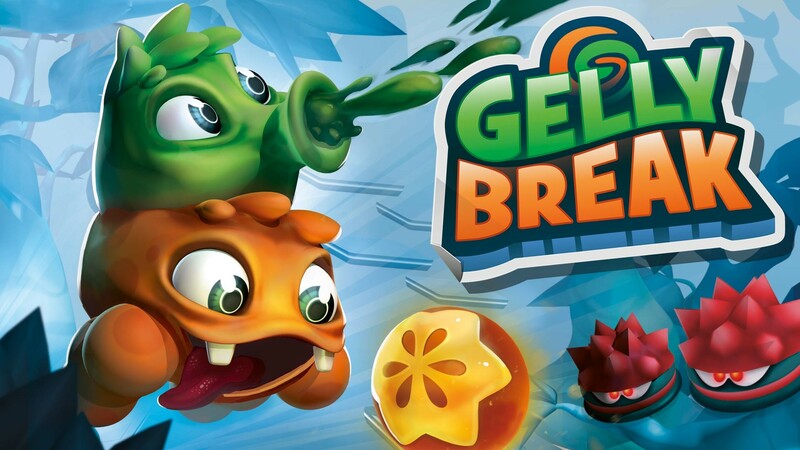 Berlin-based ByteRockers' Games aims to change that with their upcoming Switch exclusive, Gelly Break. I got to try it out at last weekend's PAX West show, and it seems like it'll be worth looking into when it releases later this year, particularly if you want to play with a partner. Gelly Break is being developed from the ground up for the Switch, and takes advantage of several of the console's unique features. It's designed primarily as a cooperative game, and the two blobby protagonists can each be controlled with a single Joy-con. Drop-in, drop-out co-op play is enabled by default, so you can swap to and from the single-player mode with a few adjustments in the menu. If you choose to play the game by yourself you control both blobs at once, which presents a different set of challenges. The main goal in Gelly Break is to traverse a series of platforming levels using four simple actions. Seperately, the Gellies have few options, and are limited to basic movement and jumping. 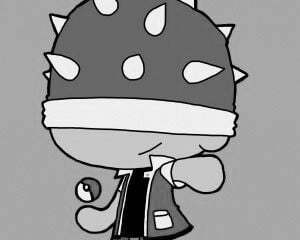 However, either one of the two blobs can jump on top of the others' head and ride around the level, and doing so allows the top Gelly to spit projectiles out of its mouth. 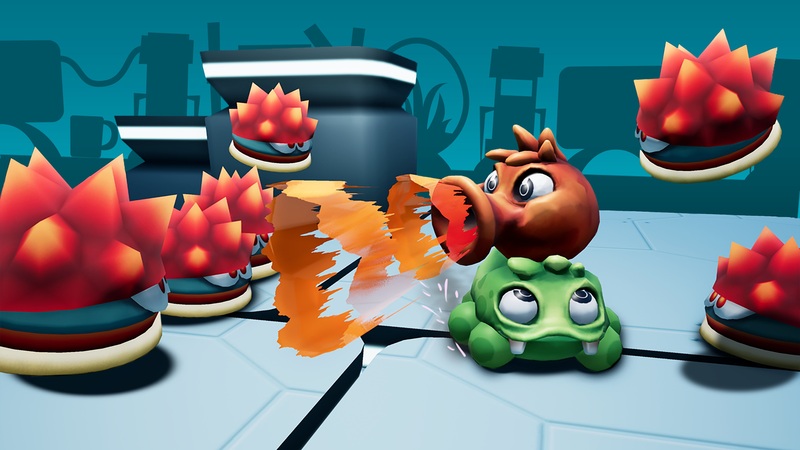 Combining their powers also allows the blobs to swap positions at any time as long as both players are holding the swap button simultaneously, and you can see if the other player wants to switch with you because a noticable icon will show up over the combined characters' heads. If you play in single player mode you can perform all of these actions using a single controller, but it's a little harder to keep track of all the interactions. Playing the game this way turns it into sort of a twin-stick shooter, albeit one where you have to keep track of which color platforms you're trying to land on. No matter which way you play both blobs share the same health pool, so they'll need to work together to survive. The combined gellies work well as a team, with the blob on the bottom driving and the one on top acting as a turret to keep enemies at bay. I had a little trouble at first because I kept wanting to jump even when I was the turret, and doing so separated the blobs from one another. The controls are easy to learn, but tough to truly master. Still, I figured out what I was doing wrong, and we were soon cruising through the level, dispatching enemies and hopping across precarious platforms. Both of the blobs can walk on the semi-translucent platforms of their own color, but the other player falls through them. Many puzzles take advantage of this fact and require players to swap who's on top mid-jump. You'll also run across glass containers that may contain health pickups or bonus items, and these can be shattered by swapping three times in rapid succession. Doing so means whoever was on top will end up on the bottom, so these glass containers give both players a chance to try the other option for a little while. Later on, some enemies turn into glass when shot and have to be finished off in the same way. Each of Gelly Break's stages has some hidden secrets, and finding all of them will unlock an alternate level on the world map. The main game's campaign can be beaten in between three to four hours, but playing through all the (much tougher) secret levels will provide a more significant challenge. Several unique bosses will bar your progress as well; the one we fought in the demo kept us moving around a rotating ring of multicolored platforms, so we had to keep an eye on which player should be in the driver's seat quite frequently. Gelly Break is designed to be friendly to players who may not be familiar with gaming, and the developer told me it's meant to be beatable by a parent playing with their child. On the other hand, those looking for a challenge will definitely find one if they take the time to unlock the optional bonus levels. Gelly Break will be exclusive to the Nintendo Switch when it releases later this year.